Islip, NY – February 6, 2019 – MacArthur Airport (ISP) is the fastest growing US domestic “hub” airport (as defined by the U.S. Department of Transportation) based on airline seats for 2018 (source: Innovata SRS Analyser). The number of seats airlines invested in the market grew from 1.70 million in 2017 to 2.17 million 2018, or 27.6% year-over-year. ISP’s airlines – American Airlines, Frontier Airlines, and Southwest Airlines – together provided more capacity in 2018 than the airport has seen in any year since 2010. Factors contributing to this growth include American Airlines’ upgrading its Philadelphia service from 38-seat deHavilland Dash-8 turboprops to 50-seat Canadair Regional Jets; Southwest Airlines’ more frequent use of larger, Boeing 737-800 aircraft; and Frontier Airlines’ commencement and expansion of both year-round and seasonal service at this popular secondary airport. The airport’s investment in its marketing campaign to attract customers and raise awareness about the products and services offered by the air carriers has created new demand to meet the carriers’ investments in seat growth. In 2018, 1,657,515 passengers used the airport compared to 1,311,614 passengers in 2017; a 26% increase. The campaign – “Stress Less. Pay Less.” capitalizes on the convenience of this local airport and the overall lower travel costs for passengers who choose to avoid the stress of New York City airports. Executed two local marketing campaigns, earning 35M impressions among Long Island customers. Grew business travelers’ intent to use ISP from 37% in 2016 to 49% in 2018 according to tracking research commissioned by ICF, ISP’s marketing strategy and air service consultant. Grew intent to use ISP by passengers in Western Suffolk and Eastern Nassau counties from 21% to 33%. Both of these increases are statistically significant. Meanwhile, over the same period, intent to use competing airports was flat. Attracted and supported Southwest Airlines’ one-stop service to Raleigh-Durham, NC, through Baltimore/Washington with no change of plane. With partner Discover Long Island, launched a leading edge cooperative marketing campaign focusing on raising awareness of and travel to Long Island and ISP from passengers in the Baltimore/Washington market. The campaign, with its custom website com,won awards from the US Travel Association for Best Branding & Integrated Marketing Campaign, and from HASMI Adrian Awards for practices in sales and marketing for the hospitality industry. Discover Long Island recognized ISP as “Partner of the Year”. Constructed a $14M new Airport Fire Rescue building. The state-of-the-art facility provides new equipment and communications to respond to emergencies. Completed Phase I – Runway 6/24 rehabilitation that includes removing and replacing asphalt, and lighting upgrades for the 7006 ft. x 150 ft. runway. All construction work was conducted at night to eliminate any operational impacts to airlines or travelers. Phase II work will commence in the spring 2019. Launched free Wi-Fi for all travelers in September 2018. Installed new multi-user flight information display screens to provide travelers with flight information as well as way finding. The new displays are ADA compliant. Conducted two TSA Precheck Enrollment Centers on site. Produced an estimated budget surplus of $750,000 through sound fiscal management. ISP is uniquely-positioned to benefit from dynamic changes in the aviation industry and, more specifically, to partner with new carriers who are identifying innovative airports with a high level of customer experience for investment opportunities. 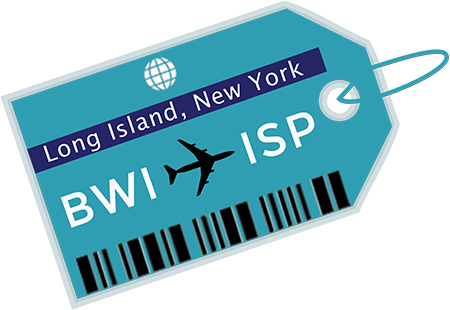 ISP will recruit new air carriers in 2019 and invest in the NY Metro market to raise awareness about ISP, while continuing to support customer development for existing and prospective airlines among Long Island residents. The airport is self-sufficient and uses no taxpayer dollars. To meet the demands of new carriers and improve the products and services offered to all airlines and passengers, the airport is proposing more than $125M in design and construction projects between now and 2022, with a goal for the airport to be debt-free at completion. 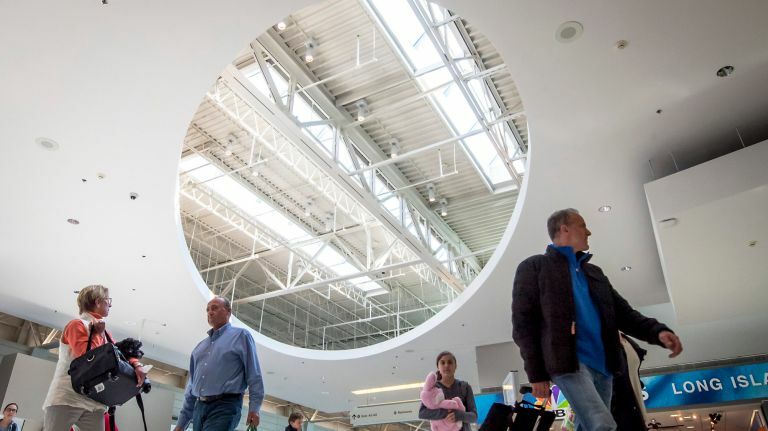 Long Island MacArthur Airport customers enjoy flights on three major US domestic air carriers: American Airlines, Frontier Airlines and Southwest Airlines. Together these carriers currently provide service to eleven cities nonstop, and connect to hundreds of destinations worldwide. The airport serves 1.6M passengers annually and employs 6000 people, with a $17M annual operating budget and an economic impact of $600M to the region and local economy.